The goal of Arrow Maker Ranch's breeding program is to produce a willing, healthy, and versatile riding horse. Next, we breed for a healthy horse. This means a horse needs to be sound, not just structurally, but genetically. We accomplish this goal by firstly, making sure all of breeding stock is 5 disease panel N/N and secondly, we breed for a balanced horse with good bone and joints. The overall health of a successful riding horse and how it handles the physical demands of training is most directly related to its inherited traits. This means that the pedigree weighs heavily on the resulting foal, effecting both mind and conformation of the body. We base our crosses with the ideal conformation coming from a Form to Function model. Each part of a horse's structure will effect its ability to perform physically, whether that effect is positive or negative. For example, a long back will carry the stress of a rider and some maneuvers less effectively than a moderate or short back. This will lead to a horse compensating for pain or inability and potentially wear out or become unwilling well before it would if conformed correctly. Our breeding program conformationally aims for a laid back shoulder; substantial enough bone to hold up to all day use, but not so thick that it hinders movement; straight, proper length legs leading to hardy feet; balance, i.e. length of the front of the horse equals length of the back; well muscled, not lean nor too buff. The structure of the head is debatably for aesthetic reasons only. A clean throat latch is currently deemed desirable due to the annoying trend of riding behind the vertical; however, when a horse is ridden holding his head so that his eye is even with his hip and his nose just slightly forward of the vertical, the throat is not constricted, so a thin "clean" throat latch is not needed for functionality. Conversely, too thick is not desirable for function nor for aesthetics. Small ears, straight forehead, and a small muzzle are nice to look at, but they also contribute to jaw structure and a proper bite. Arrow Maker Ranch's strategy when it comes to pedigree is most definitely our biggest step away from today's norm, but it yields one of the greatest advantages over other horses. 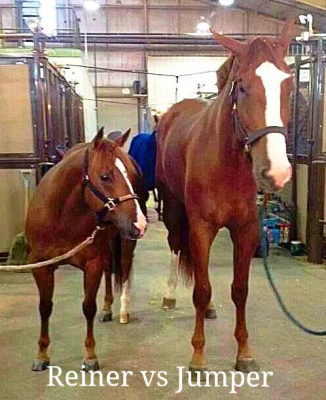 When we first started looking into breeding, we noticed that the American Quarter Horse has so much variation within the breed, that you could not use just any quarter horse for any discipline. Hunter under saddle (HUS) quarter horses are regularly over 16.2h and have no idea what to do with a cow, while cutting horses have been bred to be so short that they qualify as ponies. 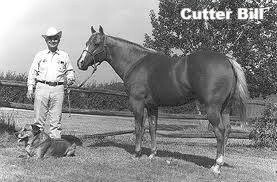 Additionally, many of the specific disciplines have been inbreeding and line breeding the most popular winners, that the horses have become less healthy, less smart, and more excitable. How many horses are bred for specific disciplines, only to be discarded or auctioned off because they couldn't hold up long enough to make it to the Futurity? For assistance on what direction we should take with our broodmare choice, we went back to the history of the American Quarter Horse and what it was about that type of horse that everyone loved so much. People loved the old American Quarter Horses for their dependability, calm thinking attitude, and ability to work a cow in any situation. We also needed to keep in mind the way the ideal quarter horse has changed since the "old days" and modernize our own program to incorporate a bit of the new specific disciplines that have emerged. By picking a foundation stallion whose pedigree included proven ranch, roping, and halter winners, we have the basis for a well conformed cow horse. He is low energy, but a very willing learner that easily retains what he is taught. Our mares needed to compliment our stallion as accurately as possible, so we chose mares with proven pedigrees in reining, cutting, and roping. They are much higher energy than our stallion, but can be too hot at times. The goal being that the resulting foal is somewhere above lazy and below hot. Our mares all ride to varying degrees, so are capable of learning and carrying a rider successfully. The hope for the resulting foals is a culmination of a healthy, fun, usable, riding horse that is versatile enough to do whatever the rider wants or needs it to do. 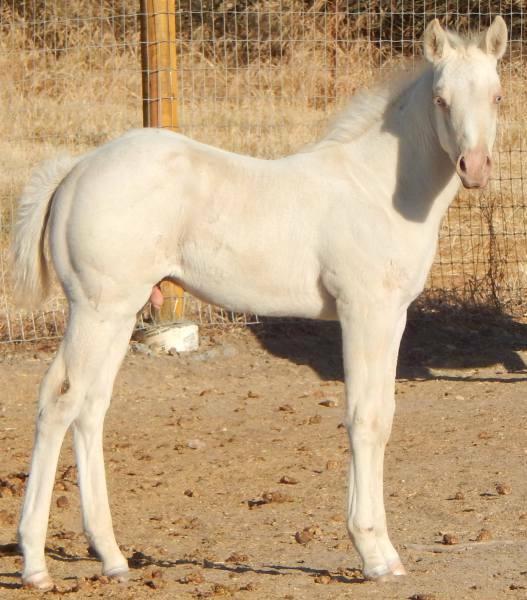 While our foundation stallion offers a color guarantee, we do not specifically breed for color. Actually, our own breeding program focuses on less color than Zeus is capable of producing. Zeus is one of a kind regarding his color. To our knowledge, he is the only confirmed perlino champagne dun roan horse of any breed. However, he is extremely sun sensitive which we believe is due to his color. He sunburns easily and has a hard time seeing in bright sunlight. These are not desirable traits and he would be able to produce the same color as himself when bred to cream carrying mares. For this reason, we do not own any cream carrying mares and we do not recommend him to breed any outside cream carrying mares. Having said that, the color of Zeus's offspring is very fun to see; like opening a birthday present every Spring. He can produce a myriad of different combinations from different mares and, as long as all the other criteria are met first, color is always fun to have.